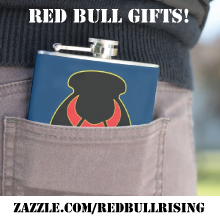 Red Bull Rising: Did File Photo Reinforce the 'Unstable Vet' Meme? Blog-editor's update: We just spoke via e-mail to Des Moines Register reporter Clark Kauffman, who is mentioned below. It turns out that, while not attributed to Robert McKevitt in the story as printed, the mention of his past (?) military service was apparently at McKevitt's own insistence. Given that information, the inclusion of the file photo makes sense. In other words—our words—the subject "played the veteran card" himself. The potential lesson-learned for journalists (and mil-bloggers)? "Not all veterans are broken, but not all veterans are necessarily heroes, either." 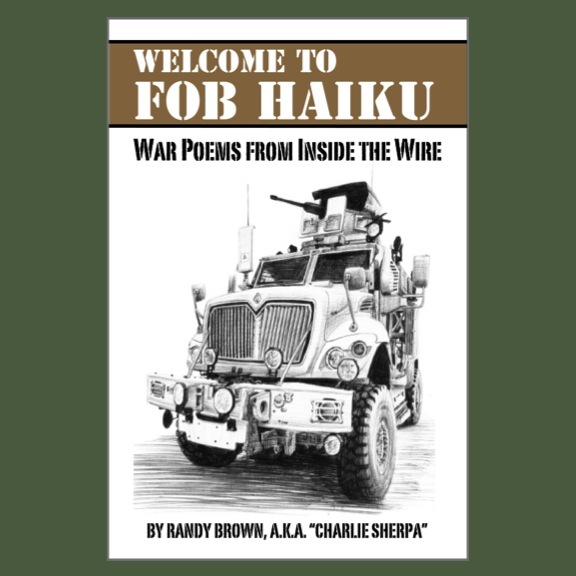 That said, writers of all kinds should remain vigilant against both the positive and negative stereotypes of veterans returned from war. When the Des Moines (Iowa) Register ran a "man bites dog" weird-news story on the front page of its Thurs., Feb. 20 print edition, it also managed to reinforce the negative "hot-tempered, hair-triggered" stereotype of military veterans returned from war. The story involved Robert McKevitt, 27, of Spirit Lake, who recently lost his unemployment benefits in a December 2013 administrative hearing. (Note: Not exactly breaking news.) 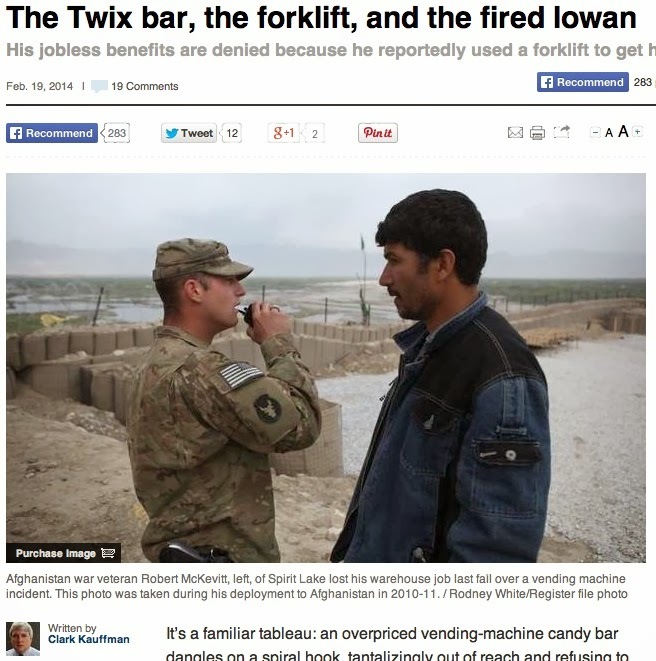 In an incident that occurred on an unspecified date at his former employer's Milford, Iowa warehouse, McKevitt reportedly used an 8,000-pound forklift to shake loose a stuck vending-machine candy bar for which he had paid. The news article, written by investigative reporter Clark Kauffman, is 9 column inches of empty journalistic calories: "It's a familiar tableau: an overpriced vending-machine candy bar dangles on a spiral hook [...]" the article starts. "For most of us, that mini-drama usually ends in defeat. But not for Robert McKevitt of Spirit Lake, whose victory over an uncooperative vending machine ultimately cost him his job." The print edition went with the straight-laced headline: "Iowan loses cool, job over vending machine." The story goes on, but the details are unimportant for the purposes of this discussion. The employer says McKevitt shook the machine and then dropped it with the fork lift. McKevitt says he carefully put the vending machine back against the wall. Either way, he was fired. Fork lifts are dangerous, and vending machines are dangerous, and employers can't afford employees who willfully create dangerous situations. The Red Bull Rising blog does not endorse the misuse of large power equipment. Even if it sounds funny in the papers. The trouble is, the Des Moines Register also went out of its way to point out that McKevitt is a military veteran. It did so because editors had a file photo of McKevitt, taken during his 2010-2011 deployment to Afghanistan along with 3,000 other citizen-soldiers of the Iowa Army National Guard's 2nd Brigade Combat Team (B.C.T. ), 34th Infantry "Red Bull" Division. So they ran the photo of him, in patrol cap and combat uniform, talking with an civilian at an unspecified Forward Operating Base ("FOB"). The grip of McKevitt's pistol is cropped out in the print edition, but remains in the on-line version. The photo is two-thirds the size of the article's total text. Kauffman's article also mentions McKevitt's service, probably to make the connection to the adjacent file photo. The article does not confirm whether McKevitt is still a member of the Iowa National Guard, however. It also does not seek to investigate or explain his unusual behavior in any way. Instead, in words and pictures, the reader is left with the impression that McKevitt's past military service is somehow relevant to the behavior that resulted in his termination. Negative stereotype of veterans as "ticking time bombs"? Confirmed. Because words matter. And pictures matter even more. Don't think that veterans are negatively stereotyped? More on that in a minute. If McKevitt's status as a veteran is relevant to the story, why make no attempt to constructively address the potential mental-health or cultural implications of veterans returned from deployment? If McKevitt's status as a veteran is NOT relevant to the story, then why was the misleading and provocative photo even included? Remember that at least one editor must have waved a yellow flag of caution prior to publication—the weapon in the photo, after all, was cropped out. The photo could have been cropped to just his face. Or, better yet—not used at all. Kauffman, by the way, is a 2005 Pulitzer finalist, and a past health care reporter for the newspaper. His health-care expertise no doubt got over-ridden at the editorial level. Certainly, his copy in this instance—even given its light-hearted, light-on-news flaws—deserved better treatment than the way it was presented on page. So did the past work of his Register colleagues, Tony Leys and Rodney White, who embedded with Iowa's 2-34th BCT multiple times during more than a year of coverage, including a few weeks in Afghanistan. And so, ultimately, did the Register's readers. And the readers of its sister publications. Notably, the latter includes those that specifically serve military audiences. "This story has nothing to do with the National Guard. Attaching this story to the fact that he is in the National Guard is pointless." "The fact that this employee happened to be in the Guard has no relevance to his civilian employment and thus this story. Stop the Guard bashing." Back at the Register's on-line story, an Iowa reader wrote: "If a story involves a U.S. veteran, his/her status as a U.S. veteran is relevant in any story regarding employment; in this 'improving' economy, veterans are having an extremely difficult time finding jobs." Yep. And depicting them as potentially crazy, aggressive, or dangerous doesn't exactly help in the hiring progress, does it? Of course, some editors might argue that, in the present age of "Support Your Troops" and "Thank You for Your Service," a negative stereotype of veterans can't possibly exist. A file photo of a soldier can't be any different than that of a coach or a teacher, right? This veteran disagrees. So do a couple of Army Times readers. Others might argue that it was obviously a slow news day, and that the candy-bar article was meant to be read with a snicker, and that veterans should lighten up. After all, didn't readers also see that story Altoona reporter Timothy Meinch, the one that ran on page 4A of the same issue yesterday? "Veterans center celebrates move with ribbon-cutting." See? The Register loves and understands veterans! 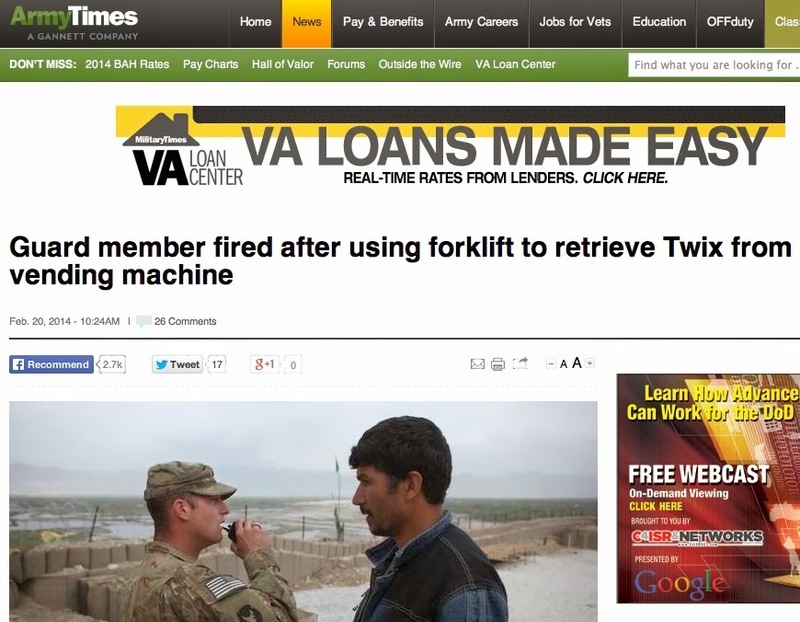 Except that the "veteran loses cool, uses forklift to get candy bar" story was front-page news, not page 4A. Editors made that decision, too. Important stuff goes to the front. Still, the candy bar story reached No. 2 "most popular" on the newspaper's website Thursday. Editors must have known what they were doing. Would the Register's editors have so blithely mentioned out-of-context an unusually behaving individual's past military service, if the 8,000-pound forklift been a weapon of some sort? Suppose there's a hypothetical incident of domestic or workplace violence sometime in the future, and someone involved just happens to be a veteran. Are the Register's editors canny enough to use that as teachable moment? 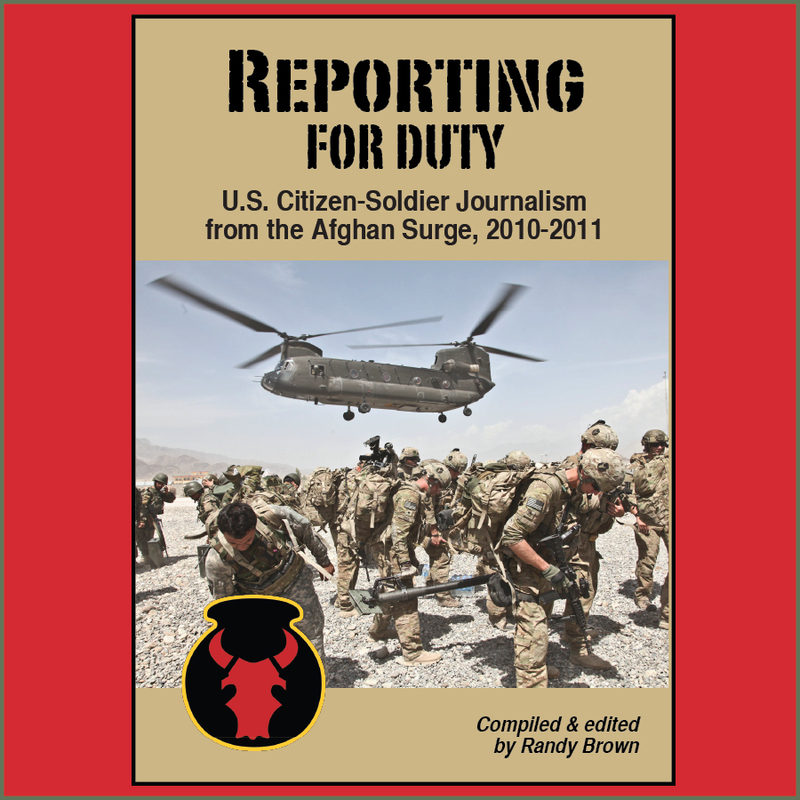 To educate readers on issues like mental health, workplace violence, and Post-Traumatic Stress Disorder (P.T.S.D.)? Or are they just going to jump to conclusions—or worse, cheap laughs? Here's the short answer: Wait and see. Just don't be the veteran who loses his cool.